Chip-enabled debit cards provide increased security at chip-enabled terminals and ATMs. A unique code in the chip protects the transaction, greatly reducing risk of fraud. Chip technology is standard in over 130 countries, so you can still use the card safely when traveling internationally. When using a terminal with a chip-enabled reader, insert the chip end of the card into the slot. Follow the instructions on the screen. Some terminals are not yet chip-enabled. In those instances, simply swipe your card. You can use your card as normal at all ATMs. The only difference will be if your ATM can read chip-enabled cards, it will hold your card throughout the transaction instead of the traditional "insert/remove quickly" motion. 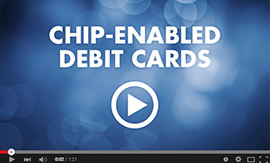 Watch how easy it is to use the Arvest Chip-enabled debit card. This video demonstrates the process. Arvest chip-enabled debit cards are available in a wide range of designs. Visit our Specialty Debit Card page for a full catalog. How do I get a chip-enabled card? Copyright © 2015 Arvest Bank. All Rights Reserved.